The Panasonic LUMIX DMC-FZ1000 is the world’s first bridge camera to feature 4K video recording. 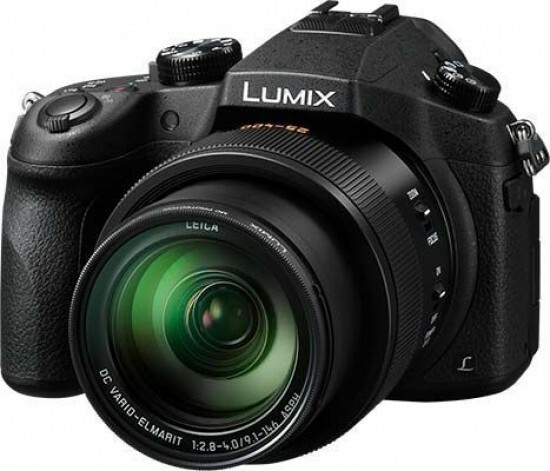 The Panasonic Lumix DMC-FZ1000 is a super-zoom camera featuring a wide-angle 16x zoom lens equivalent to a focal range of 25-400mm, a 20.1 megapixel 1-inch MOS sensor, a 3-inch 921K-pixel rotating LCD screen, a 2,359k OLED Live View Finder (LVF), 1920x1080 60/50p Full HD video recording, 0.09 second auto-focusing speed, wi-fi and NFC connectivity, and 12fps continuous shooting without autofocus and 7fps with autofocus. Other key features include RAW format support, an ISO range of 125-12800, manual shooting modes, Intelligent Resolution technology, a 3.5mm port for an optional stereo microphone, and an accessory shoe for an external flash. 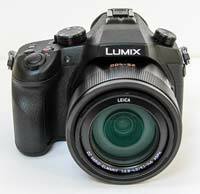 The Panasonic Lumix DMC-FZ1000 is available in black and retails for £749.99 / $899.99. Panasonic has confidently pitched the newly available-to-buy Lumix DMC-FZ1000 to photographers and video makers alike as an ‘epoch’ product that it hopes will prove to be a game changer. It’s clearly pretty excited to have the first compact camera to not only feature 4K video capture, but which also allows photographers to extract a still image from a 4K sequence, to end up with the equivalent of an 8 megapixel photo. In terms of video we also have the option for time-lapse effects and stop motion animation with this model, so one could argue this is clearly a ‘hybrid’ product. Thankfully this premium camera has some premium features to help justify the hype. These include a one inch 20.1 megapixel ‘Mos’ sensor – the same physical chip size found in Nikon’s ‘1’ system or Sony’s RX10 bridge model – plus a Leica branded lens. The latter provides a focal length the equivalent of an ultra wide angle 24-100mm in 35mm terms, translating as a 16x optical zoom. Naturally bird watchers, outdoor photographers, amateur paparazzi and simply family users will find such a broad range of framing options very useful, as they would do with any big lens ‘all in one’. Also on board is what Panasonic claims is a newly developed Venus Engine processor, with a quick (in fact almost instantaneous) start up time, faster AF response at the telephoto end of the zoom (again we’re talking blink-and-you’ll-miss-it fast), plus high speed OLED display all adding up to the fact that, it says, there is nothing else in the Panasonic range currently at this level. The FZ1000 obviously resembles your typical bridge/ super zoom model from all angles, ape-ing the look of a full-blown DSLR, which immediately instills confidence while building expectation. Notable on-board features include a 2,359K dot OLED EVF and 921K dot, 3-inch ‘free angle’ LCD screen. That lens reach, prominent electronic viewfinder, tilting screen and a decent sized handgrip have all resulted in a slightly chunky camera that obviously comes from the same ‘stock’ as the GH4. While the chunkiness might dissuade some, others will be glad to at least feel they’re getting their money’s worth for the £749.99 manufacturer’s asking price. There is also the point to be made that the FZ1000 weighs around a third what a DSLR kit with equivalent lens might – so portability here is still key. It’s also worth mentioning that the lens’ maximum f/2.8 aperture – running to up to a still respectable f/4 at extreme telephoto – will give us DSLR-like ‘bokeh’ effects, enabling attractive shallow depth of field look for portraits and still life shots whatever the framing option chosen. Further notable features include 49-area AF, in-camera raw processing, face and eye detection technology, seamless 1 area AF, pinpoint AF and shutter speed of 1/4000 sec, plus an electronic shutter function for when photographers want to avoid potentially subject distracting noise – very useful when taking the night shots for this test report and wanting to avoid getting mugged! Aiming to make this camera truly a jack-of-all-trades, Panasonic’s picture control mode now offers up 22 filter effects on the FZ1000, which feels like an almost exhaustive amount as you scroll though the various options. Naturally since this is 2014, Wi-Fi connectivity is another box that needs ticking and here the camera offers up both NFC and QR code interaction, along with the prospect of remote shooting with use of a Panasonic ‘app’ that includes a new photo collage creation function. Providing the hands-on feel for those who want it, the FZ1000’s zoom can be controlled via the regular zoom lever surrounding the shutter release button, as on any point and shoot compact. Alternatively this can be done by flicking a zoom/manual focus switch on the side of the lens barrel, and either focus or lens reach automatically adjusted by turning a lens control ring. Whether you’re put off by the fact that a bigger than average lens means a chunky camera or are positively enthused by that fact, from all angles the FZ1000 certainly looks like it means business, which is reassuring given the high-ish price tag of £749.99, though street prices may be slightly cheaper a little after initial launch. The mottled finish and leather effect padding will cause most observers to suspect you’re wielding a DSLR from a distance. As you’d imagine it handles like one too. And the large-ish, bright and clear electronic viewfinder with a prominent eye relief means that we just about get away with avoiding our nose smearing up against the main monitor screen, though the larger and more flexible screen is what we most naturally found ourselves using when setting up or reviewing shots. Unsurprisingly, that large Leica branded glass lens dominates proceedings here with its 25-400mm focal range and aperture range stretching from a bright/fast f/2.8 to a perfectly acceptable f/4 at the telephoto end. This, and probably not purely the fact that the camera shoots 4K video, is what the majority of users will be buying it for – though the latter feature is certainly a bonus in terms of future proofing your footage, providing you have the storage capacity to deal with the resultant huge 4K file sizes. Interestingly on this camera, the default still image ratio is now 3:2, which gives us the full 20.1 effective megapixel image. If you want to opt for the 4:3 ratio usually provided as the standard on a digital camera, this results in a resolution squeeze down to 17.5 megapixels. Naturally there’s the ability to capture Raw files or Raw files and JPEGs in combination. Since the latter option barely affected writing speed in the slightest, we chose it as our own personal default setting for the Panasonic. To help with the ability to hold the camera nice and steady at maximum zoom, the FZ1000’s manufacturer has thoughtfully provided us with a comfortably moulded handgrip around which we were able to wrap three fingers, leaving our forefinger to hover expectantly over the shutter release button. The latter sits atop the handgrip, tilting forward at an ergonomic angle, encircled by a zoom lever. Situated just behind these controls are two further buttons on the top plate. To the left we find a dedicated video button and on the right the first function button, marked ‘Fn1’. Drill into the menu screens and it’s possible to manually attribute a wide variety of functions to such buttons, including the ability to call up Panasonic’s Photo Style settings (the default factory option, seemingly), a level gauge – also summoned up by a press of the ‘display’ button – or alter the aspect ratio, just for starters. In fact, on this model there are 11 screens’ worth of user-attributable options, with four options presented on each, so the customization of said controls certainly feels almost limitless. If you so desire, the ability to make this camera your own – or to ‘build your own camera’ as some rivals are found of saying in their marketing, is here. The FZ1000’s second function – or ‘Fn2’ – button sits just behind the first. Here the default factory setting is to enable the camera to establish a Wi-Fi connection – seen as a must on any digital device these days. Via this mode we can also set up remote shooting and viewing with the aid of a smartphone, plus Panasonic’s free downloadable app, transmit images whilst recording or send those already captured and stored by the camera to a suitably enabled TV set for shared viewing. The other notable control nestling nearby on the top plate is for the camera’s shooting modes, of which 10 are offered – including the usual fully automatic, manual and custom settings – with the dial ergonomically encircled by the on/off switch. Give this a flick with the thumb, and, as soon as said thumb comes to rest, the camera is powered up; which is as quick as anyone could hope for. This responsiveness extends to the use of the lens, which travels through its optical zoom range from wide-angle to maximum telephoto setting in 4-5 seconds when in stills shooting mode. Even at maximum telephoto setting a squeeze of the shutter release button and the camera determines focus in a blink of an eye. If there’s potentially distracting foreground objects when fully zoomed in on your subject – such as bars on a cage at the zoo, or foreground shrubbery in a landscape shot – of course this will confuse the auto focus slightly – though a slight re-framing and subsequent press quickly eliminates the problem. On the FZ1000 the selectable shooting modes include the expected intelligent Auto setting and palette-like icon indicating creative controls. The Panasonic has eight screens’ worth of digital effects on board selectable in this mode. These range from our particular favourite of the saturation boosting ‘Expressive’ colour through the sepia tinted ‘Retro’ and the more white-ish if slightly clumsily named ‘Old days’, and include the more self explanatory High Key, Low Key, a slightly unnecessary ‘Sepia’ (given the previous Retro and Old Days options), Monochrome, more high contrast Dynamic Monochrome and grainy film-like Rough Monochrome, Silky Monochrome, the high dynamic range ape-ing ‘Impressive Art’, a separate High Dynamic setting, Cross Process, a vignetting Toy Effect, a more luridly saturated Toy Pop, Bleach Bypass, Miniature Effect, Soft Focus, ‘Fantasy’ – bathing everything in a light blue-ish wash (a it like we’ve left the camera on ‘daylight’ setting) – plus Star Filter, One Point Colour and Sunshine setting – the latter of which mimics a burst of sunshine intruding from the top of your frame, so enlivening rather dull shooting conditions with the haze of a summer’s evening. The next shooting option discovered with a further turn of the mode dial is the scene settings, of which there are 25 here, including the likes of Silky Skin and ‘Sweet Child’s Face’, Vivid Sunset Glow, Glistening Water, ‘Cute Dessert’ – from which it would appear obvious that this camera has originated in Japan (!) – and finally, a panorama option. Moving around the shooting mode wheel we find two customisable settings, followed by a dedicated mode for video. Here we can switch between AVCHD video capture and MP4 – interestingly, if you want to shoot the maximum 4K video – i.e twice as high quality as Full HD – then a switch to MP4 mode is required before you can implement that setting on the Panasonic, with a resultant 25 frames per second capture speed. In other words 4K shooting is not available with AVCHD compression. Continuing around the dial, the final four shooting setting options are for the regular creative quartet of manual, shutter priority, aperture priority and program modes. Jumping across the ‘hump’ in the middle of the top plate, housing the electronic viewfinder, vacant hotshoe, stereo microphone and pop-up flash, we come to a second, smaller dial with ridged edge. Here we get access to the camera’s drive modes, which range from single shot capture through high speed burst, to exposure bracketing and further self timer and interval shooting modes. In other words all the essentials are easily within reach of forefinger and thumb, and, despite the camera’s relative bulk, without too much of a stretch. Moving our attention to the backplate, this is obviously dominated not only by the tilt, swivel and flip LCD screen, but also by the aforementioned EVF that juts out above it. The malleability of the screen is such that it can be turned to face the subject for that inevitable ‘selfie’, or flipped screen inwards affording added protection when in transit. It’s worth saying that we were very impressed with the clarity of screen, which comes into its own when focusing manually. Select this option and a central portion of the image is magnified, making matters even easier, and bringing even the scribbles on our notepad into sharp relief. In terms of composing our shots when leaving the camera on its automatic default, the eye-level electronic viewfinder provides the obvious benefit of a built-in eye sensor immediately below, thus automatically activating and by turn deactivating the larger LCD when it senses the proximity of an eyeball. Over time, such little touches add up to a big benefit in terms of the unit’s intuitiveness. The short sighted also get a dioptric adjustment wheel to the left of the EVF, as viewed straight on, and just up from this we find a manually activated sliding switch for raising the pop-up flash, which announces its presence with a reassuringly solid sounding ‘clunk’ when called into action. As well as the eye sensor, there is a button to the left of this marked ‘LVF’ for manual activation if desired, which feels a bit redundant given the camera’s responsiveness. Luckily this also doubles up as one of the customisable function buttons – ‘Fn5’ to be exact – should you wish to change its function. 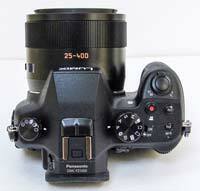 Attendant controls veer towards those of a DSLR – for example an auto focus/auto exposure lock, encircled by a lever for switching between single shot and continuous auto focus, or on to manual (focus). Switch to manual focus and flick the two-way lever on the lens barrel from ‘Zoom’ to ‘Focus’ and, as noted earlier, your deployment of the lens ring can be changed. The default setting of the ‘Fn3’ button to the right of the lock/drive mode buttons provides access to the usual Panasonic ‘Quick Menu’ bar. Selectable from this are the Photo Style settings, which here range from the default ‘Standard’ setting to Vivid, Natural, Mono(chrome), Scenery, Portrait, and Custom options. A top-of-screen toolbar further provides access to flash modes, which include forced flash, forced flash with red eye reduction, slow sync and slow sync with red eye. 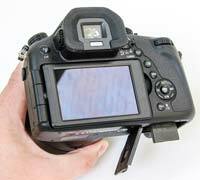 Image size and picture quality can also be adjusted in this manner, along with, again, AF modes. Such options can either be tabbed through using the camera’s four-way control pad – which we’ll get to in a moment – or a thumb spin of a DSLR-like control dial top right of the camera back. Again there are a variety of options for arriving at your destination with the FZ1000. But this doesn’t make it a confusing camera to use or difficult to get to grips with. On the contrary; more options are simply more options. Between this ‘Fn3’ and ‘display’ button we find a standard playback control, with a press of the display button not only showing or hiding on-screen options but also, with subsequent presses, bringing up a level gauge – useful for photographers/ videographers shooting landscapes and cityscapes without the support of a tripod. Bottom right of the camera’s back plate is the aforementioned four-way/directional control pad. Selectable here are ISO sensitivity settings, which include both auto and ‘intelligent’ ISO options, along with manually selectable staggered increments from ISO125 to ISO12800. White balance and macro mode implementation also happens via the same dial. The very bottom of the FZ1000 features a further user attributable ‘Fn4’ button which doubles up as a dedicated ‘delete’ button in playback mode, with the base of the camera featuring a slightly off-centre screw thread for tripod attachment and shared compartment housing both rechargeable battery, good for around a respectable 360 shots, plus SD card. 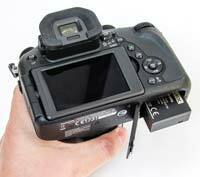 This means that HDMI and USB output ports are provided under a very stiff flap at the camera’s side, which also allows for remote input, while on the opposite flank of the camera there’s a port for attaching an accessory microphone. Clearly this is a camera with ideas and ambitions beyond what is already on board, out of the box.